Would you like to join me for one of my all-time favorite desserts? 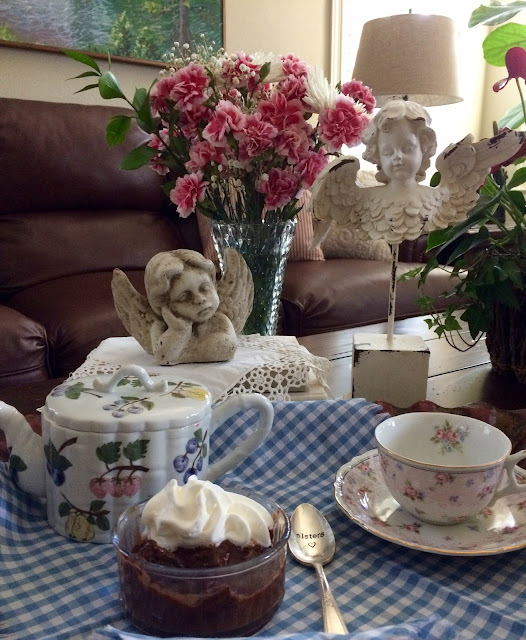 We are having some Brownie Pudding and some Black Forest Cupcake tea that a sweet friend sent to me, who knows how much I love it! This teacup, named Petit Rose, came from Stephanie's teacup exchange a couple of times ago. Isn't it a sweet design? My friend, Bea, gifted me with this pretty teapot. I love mixing and matching patterns. This recipe comes from my vintage Better Homes and Gardens Dessert Cookbook that I started using as a bride in the 1970's. I have to say that it is one of my all-time favorite desserts, and came about before chocolate molten or lava cakes were popular. This dessert is all about cozy comfort foods! I hope you try it. Sift together the first five ingredients into a medium size bowl. Add milk, oil, and vanilla; mix smooth. Add nuts, if using. Pour into a greased 8x8x2" pan. Mix brown sugar and the 1/4 cup cocoa powder; sprinkle over batter. Pour hot water over entire batter. Bake at 350 degrees for about 45 minutes. The sauce will be on the bottom and the brownie part will be on the top. Let for for a bit before serving, as the sauce will thicken up some. Scoop the brownie part and spoon the sauce over top into bowls. Serve with ice cream or whipped cream and enjoy! I recently started crocheting these cute bears from the book, Magical Amigurumi Toys, which can be found on Amazon. They're a fun project and make perfect gifts. I am intrigued by Black Forest Cupcake tea!! Sounds delicious! I might add your Brownie pudding looks a treat as well. 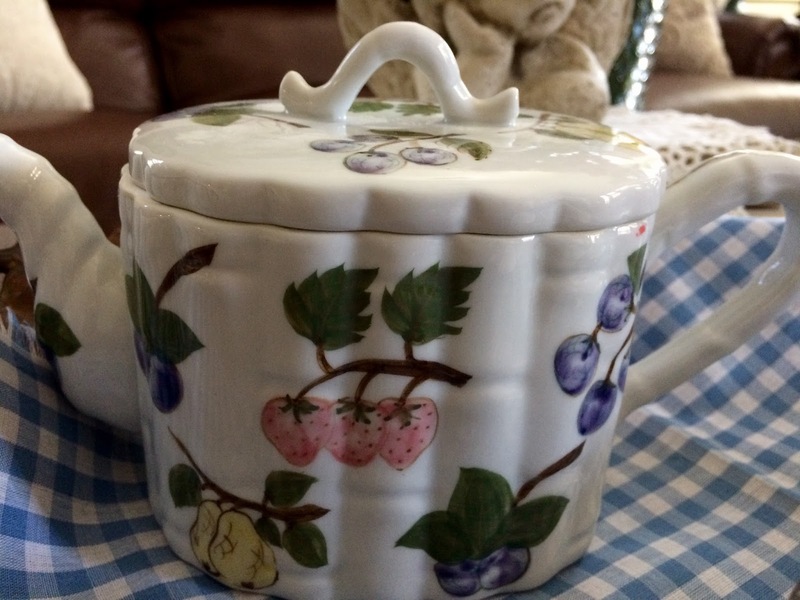 What a pretty teapot. The mixing and matching of teacups and teapots is fun isn't it. What sweet little bears; how clever of you to have crocheted them. That brownie pudding sure sounds good, kitty, the black forest cupcake too! Love your teacup. Your Brownie Pudding sounds as if it would be warm and soothing when one NEEDS a chocolate fix. 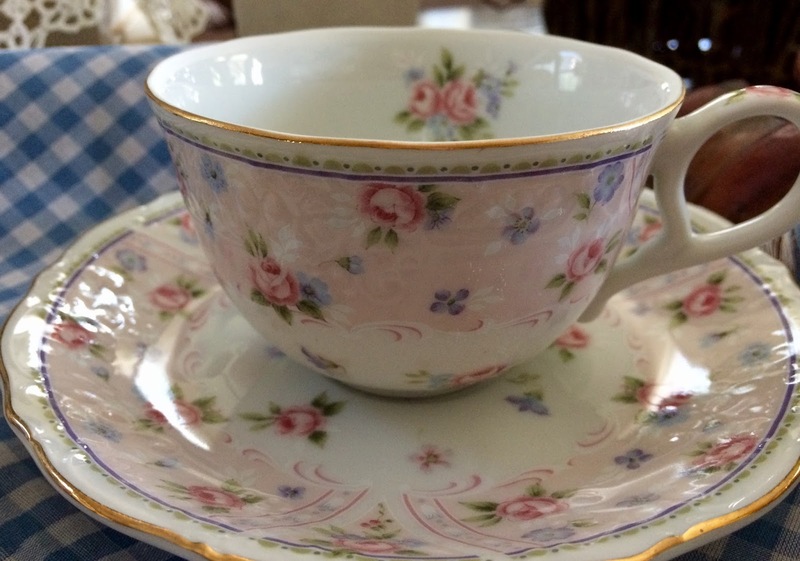 Your tea cup is especially feminine and lovely. And those bears are just the cutest! You make the sweetest things, dear friend. Love and hugs to you! I am trying this today! I wanted a chocolate dessert for lunch and this sounds perfect! Thank you. A recipe similar to this was a favourite in our household as the children grew up. Very comforting. Such a pretty teacup! The bears are so cute. Have a wonderful day, Kitty. It never occurred to me to combine brownies with pudding. YUM!!! Your decadent brownie pudding is right up this chocoholic's alley. I'm sure that the black forest tea tastes much better in your pretty teacup. I gained 3 pounds just reading this delectable post, Kitty! Your teacup and teapot go perfectly together, and those bears are beyond cute! Have a happy and wonderfully blessed week, my friend. Hugs. The teacup is beautiful. Love the little bears-very cute. The brownie pudding-wow. I'll have to save that one for a binge dessert! Enjoy this nice weather! Yum! I have never made a brownie pudding but this is right up my alley. I will for sure be making this soon. Your teacup is really pretty, Kitty, and the little bears are too cute. Have a beautiful day, my dear friend. Hi Kitty, your pudding looks and sounds so good. I love your cute little bears you crocheted. I would love to make them from a simple pattern. Thanks again for sharing your creations at C&C with J&J. I've had black forest tea (from you?) and it was good. Your pudding looks delightful and the crocheted bears are adorable. Let the birthday partying begin! Oh yes, please! If I only had a kitchen to prepare it in! That really sounds delicious, and the teapot, especially in the setting, looks inviting! I think Mary, has a great idea about a post showing all your teacups. Your yummy dessert looks so good and the teacup is so pretty. I'm going to look. I think I have that cookbook by Better Homes and Gardens. Now that's a chocolate lovers dream! Your tea cup is gorgeous and such a darling tea pot. You are such a busy lady and yet you have time to craft as well. Beautiful. You make the prettiest desserts and yummiest desserts! I am a chocolate lover, so this is right up my alley! What a lovely dessert. I can almost taste it. Yummy dessert and yummy tea, too. Those bears are adorable. So sweet! Have a great week. OMG, Kitty... I want to climb through my computer and inhale that brownie pudding. Have a wonderful week. I think I may have made this pudding before, maybe it was called radio pudding (I have no clue why? lol!) But it is surely delicious and reminded me that I haven't made it in a while! Now, I'm hungry for my chocolate fix, lol! 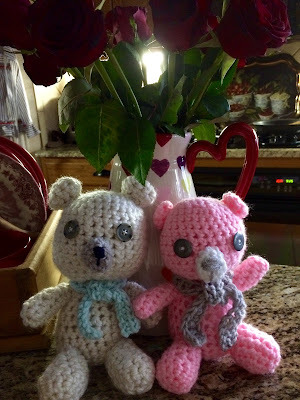 And those darling bears that you are crocheting are soo cute!!!!! Oh that brownie pudding looks so good -- and I just happen to have all the ingredients. Hmm . . . Sure would taste good on a cold and cloudy winter's day like today! I love that teacup! So feminine. And your angels, love. Mouth watering! Reminds me a bit of the chocolate pudding cakes that you pour hot water over and it makes a lovely pudding to accompany the cake. Oh boy, what a great way to do brownies! I have had the biggest urge for sweets lately, I hope it will die down after February, is over :) Congrats on being the featured blogger at FF&E this week! Brownie pudding??? What could possibly be better than that??? Thanks so much for the recipe. Love that sweet tea cup too. We must be thinking alike...I made this last night with my mother's recipe (a few changes)! So easy and good with a scoop of ice cream! Kitty, I can't decide which item I love the most...your pretty teacup, that darling teapot OR that yummy looking brownie pudding!!! All look positively LOVELY! Thanks for the recipe! I just love that beautiful teacup that you are using this week. 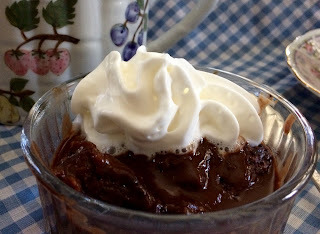 I can't wait to make your Brownie Pudding, sometimes the older recipes are the very best! We always love your recipes at Full Plate Thursday, thanks so much for sharing them with us!